On the night of Sept. 27 and into the early hours of Sept. 28 the earth passes between the sun and the moon. Read all about the phenomenon of the total lunar eclipse with regard to astronomic and astrological point of view! The exact date of the total lunar eclipse was (umbra): 28th September 2015, 4.10a.m. CEST until 5.23a.m! The darkening had begun at 3.07a.m. (Central European Summer Time) This phenomenon could be watched in the sky above Central Europe. If you wanted to attend you had to get up in the wee small hours of the morning. It could be watched above Western Europe, West African skies, South America and above eastern parts of the United States of America and above the eastern part of Canada. A lunar eclipse occurs when the earth passes between the sun and the moon. This happens and so the sunbeams could not meet the moon, because the earth stands directly between them. The moon cannot be seen. This time there was a total lunar eclipse. So the moon was completely hidden behind the umbra of the earth. There are partial lunar eclipses: if it is shown just a hidden part of the moon, this is to be watched in the skies above Pacific region, the Antarctica, New Zealand and North East Asia. Try to imagine what impression such natural phenomenon could cause in the past in consideration of profound belief, religion and superstitions. Darkness has never been a welcome companion of mankind and so they felt threatened and were in fear of such phenomena! Just with the view to religion and even abuse of religion lots of archaic structures have been revealed and were becoming obvious. Gods were taken for mediators between various worlds and different forms of existence. Sacrifices of all forms were made and their temples were the stages for those plays. In each tradition is to be found a god of merchants and a god of thieves as well, so nowadays and before. We should not neglect our conviction that all - or mainly the most of these events have not been done voluntarily. It is still a prosperous business to make some money and gain riches by the pain and grieve of believers of all humankind. Hoping the best for the future and expect and develop basic trust in nature – and cultivate a familiar behavior and attitude towards such facts of history of mankind. But the times have been changed meanwhile. Physical phenomena are explored and can be explained well. Such scientific findings give the impression of tranquillity and calmness. So by the way in all conscience other levels of consciousness have made a change of awareness. Experiences are brought together the mental-spiritual area. Natural science might deny these matters, but strictly speaking there is a profound truth to this. These phenomena exist and whatever you are convinced from: it remains an ambiguity and a two faced consideration, like the bright and the dark side of the moon herself. The constellation when a lunar eclipse takes place. On Monday 28th September 2015 – start of the event at 4.10h a.m. CEST and its ending at 5.23h a.m.
What is the direct effect on humans? Opinions often diverge on the point… from a negative attitude towards such influences up to euphoric popularity. Conceptions are always changeable – from one to another. The darkening warns of an imminent calamity and sinister atmosphere on earth. The sun (male) is the father: he represents virile strength and power. The moon (female) is the mother: she represents the life-giving energy, affection and devotedness. You recognize with regard to these concepts, each element has its task and each depends to one another. Consequently nothing will last forever. They affiliate in a perfect manner and so the male and the female principles are harmonizing and – that shows the crucial point and its whole significance: Opposed characters find their way when the idea, the birth by fire, contacts fertile and life-giving power, the primal elements fire and water give rise to steady growth. They support each other and by the influence of indulgence, prehistoric wisdom and ancient dependence brings out the best conditions for all forms of life on earth. In case of emancipatory practise you could think it could be unjust, just to depend on love and devotion, it must be noted this is not the crucial point. It works by the anthroposophical knowledge. Each gender experiences the opponent structures of development and creates the so-called holistic approach - derived by the perpetual process of incarnation life can resurrect. The opposition does mean the two celestial bodies, the sun and the moon, are facing each other. Such a constellation is called opposition. Generally accepted does it mean this contrast has a negative and calamitous influence on our sensitivities, but it represents the elements in their most expressive form. During a lunar eclipse the sun and the moon are not just facing, they are disturbed when the earth crosses their way at the same time. 1st: the light beam from the sun becomes invisible. 2nd: the effect on the earth is reduced by the interruption of the radiation. Maybe this causes an energetic reduction on earth. Somehow it creates a situation of policy and diplomatic discourse… this is exceptional case this time. Might be some miracles during the lunar eclipse takes place? We can say for certain. Miracles happen all the time. We have no influence on those events. The occurrence of miracles is based on outer space experiences and is related to angels and arch angels. It derived from distinctive categories, which deals with reward and atonement in relation with former lives and deeds. Who is benefited by hidden forces? What one might suppose, it addresses those, who are in search for their own secrets; occult and sinister parts are given to each of us. The discovery of these characteristics is part of a certain individual development, maturity and self-cognition. We will see how with consideration of mutual respect mental-spiritual growth. Those, who agree with the mentioned terms, will gain another level in their existence. Immortality is no miracle it has its origin in archaic believe and ancient structures: religious reverence and beatitude should be our purpose on this earth. What occurs in the rest of the world? Those, who will be sleeping while the lunar eclipse takes place - might be the rest - could help it to sense free and will be sleeping the sleep of the just… actually the majority of human kinds. Maybe you could be curious and dreamy… Why should its effect be neglected? Time comes and goes – it might be a circle and you are right in the middle – do not miss too much: you are able to achieve the supreme mundane level. On 28th September is one in the line of four lunar eclipses. It is a consecutive course of lunar eclipse events. This is called a tetrade. Tetrades are rather rare: Such a cyclus time like this just happens four times during the past 500 years. Conspirators try to make sure it is a reliable sign that the world would soon be coming to an end. Of course, this attitude will exist for the coming 1.000.000.000 years… but by then a lot of time will pass by. The enormous mass of the sun should have been enlarged. 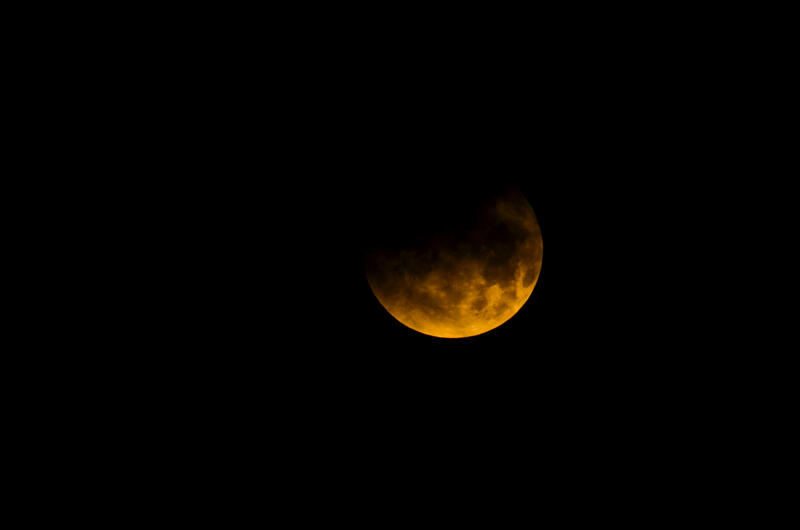 During a lunar eclipse the moon is called crimson moon or blood-red moon. She appears reddish shimmering. She is not completely out of sight, but a fragile shadowy appearance remains visible for us, who are watching. This form of appearance is caused by the light refraction of earth’s atmosphere. This time the moon shines in deep red glow. The longest appearance for a lunar eclipse takes 106 minutes.